Providing renal transplantation is an important function of the Division of Nephrology. Each year approximately 150 patients receive either living-related or cadaveric renal transplants under the supervision of the Division. We evaluate patients before transplant, assist in their management during the admission for transplantation, and follow patients once discharged. In the outpatient renal transplant clinics we manage immunosuppression, hypertension, hyperkalemia, polycythemia and other complications of renal transplantation. Should acute or chronic rejection occur, we evaluate patients extensively, including transplant biopsy, if needed, and then implement necessary anti-rejection therapy. All renal transplant patients admitted to either Shands Hospital or the Gainesville VAMC are seen and cared for by members of the Division. The UF Health Shands Transplant Center is ranked 19th in the nation. 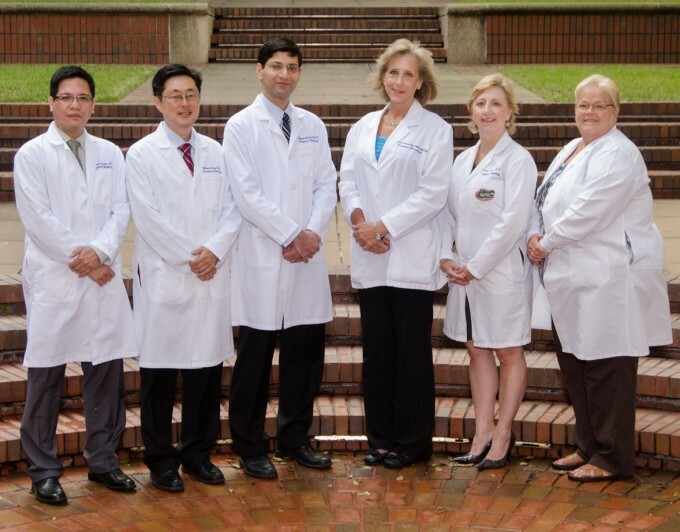 Our program features UF physicians and multidisciplinary teams of specially trained coordinators, nurses, social workers, pharmacists, physical therapists and psychologists who are experts in transplant care. The UF Health Shands Transplant Center performed the first successful kidney transplant in Florida in 1966. Since then, UF physicians transplanted more than 4,500 patients with End-Stage Renal Disease. For additional information, including referral for transplantation or follow-up in the renal transplant clinics, please call (352) 265-8243 For more information on the UF Health Shands Transplant Center, please visit their website.